In this chapter Kallenbach argues for an analysis of Henrik Ibsen’s A Doll’s House (1879) as a “disenchantment of the wonderful” and as a confrontation with the Idealist aesthetic regime and its interpretation of imagination. 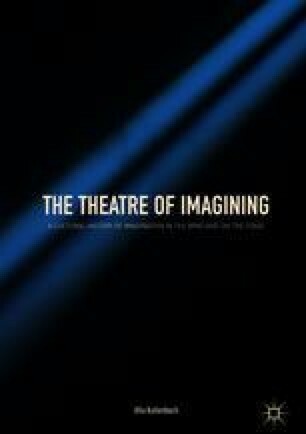 The chapter examines how the play, and in particular its use of costume and scenography, draws on a wide range of cultural references to Idealist aesthetics that were part of the “cultural imaginary” for the contemporary spectators. Analyzing the play from the spectator’s position, from a scenic, rather than verbal, perspective, Kallenbach presents new interpretations of Nora’s tarantella; of Raphael’s Sistine Madonna, a picture which was added to the set in the first Danish and Swedish productions; and of the significance of the Christmas tree in the Idealist context. Andersen, Hans Christian. Lucky Peer. (1870). Translated by Jean Hersholt. http://www.andersen.sdu.dk/vaerk/hersholt/LuckyPeer_e.html. ———. Skyggebilleder. København: Det danske Sprog- og Litteraturselskab, Borgen, 1986. http://adl.dk/solr_documents/andersen01val-workid54103-kbOSD-0=page:92. “Anmeldelse av Et Dukkehjem ved Christiania Theater.” Morgenbladet 62, no. 20B, 21A (1880). http://ibsen.nb.no/id/11156157.0. ———. “Henrik Ibsen’s “A Doll’s House” at the Royal Theatre.” Ude og Hjemme 3, no. 118 (1880): 148–53. http://ibsen.nb.no/id/11195169.0. G. “Henrik Ibsen: Et Dukkehjem.” Bergens Aftenblad 1, no. 1 (1880). http://ibsen.nb.no/id/11180486. “Henrik Ibsen, Et Dukkehjem. Skuespil i tre Akter. (Kjøbenhavn. Gyldendalske Boghandels Forlag).” Bergens Tidende 12, no. 294A & 295A (1879). http://ibsen.nb.no/id/11180390.0. Petersen, Fredrik. “Henrik Ibsen’s Drama “A Doll’s House”.” Translated by May-Brit Akerholt. Aftenbladet (1880). http://ibsen.nb.no/id/11186647.0. Rung, Henrik. Tarantella af “Gioacchino” : Indlagt i Henrik Ibsens “Et Dukkehjem”. København: Wilh. Hansen, 2007. http://img.kb.dk/ma/bournon/df168-02.pdf. Skram, Amalie. “A Reflection on “A Doll’s House”.” Translated by May-Brit Akerholt. Dagbladet 12, no. 15 (1880). http://ibsen.nb.no/id/11186656.0. Thrane, C.. “Premiere of A Doll’s House at the Royal Theatre.” Translated by May-Brit Akerholt. Illustreret Tidene 21, no. 1057 (1879): 145–48. http://ibsen.nb.no/id/11183655.0. “Urpremieren på Et Dukkehjem ved Det Kongelige Teater.” Aftenposten 20, no. 298A (1879). http://ibsen.nb.no/id/11112796.0. Vullum, Erik. “Henrik Ibsen: A Doll’s House, Play in Three Acts. Copenhagen, Gyldendal Publishers (Gyldendalske Boghandels Forlag), 1879.” Translated by May-Brit Akerholt. Literatur-Tidende (1879). http://ibsen.nb.no/id/11186623.0.